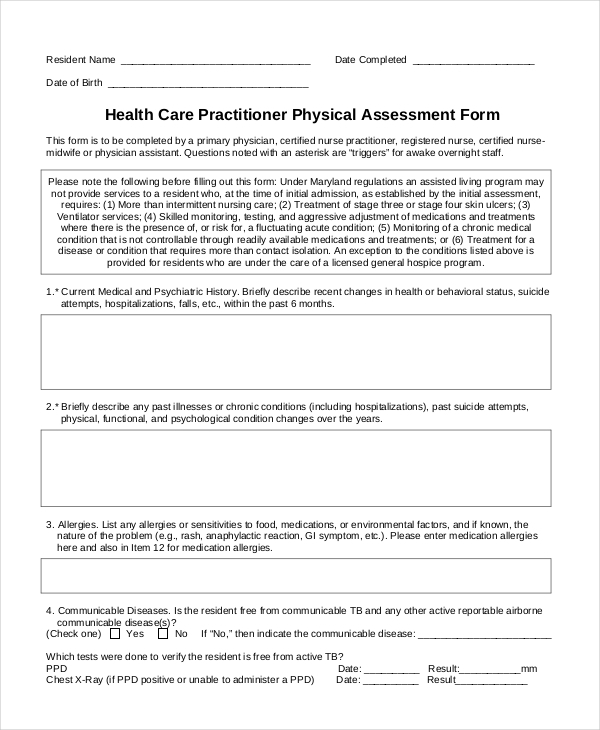 A health Care Practitioner Physical assessment form is a type of a form which is completed by a primary physician, a certified nurse practitioner, registered nurse or a physician assistant. The form is used to judge a person from the ground of various health issues. Medical history of an individual, past illness or chronic diseases if any , a list of various allergies that may affect a person, the various communicable diseases and there are many in the list which needs to be filled. This information is provided to the medical practitioner for the final evaluation about the health of a person. This is a type of a form which is used to evaluate an individual’s current fitness level. The form includes a series of measurement that helps in determining the fitness level of a person. The form demands various information of an individual like the height, weight, heart rate, blood pressure level, body composition, sit up test/mint, push up test/min and various other physical information which accurately calculate the physical fitness. 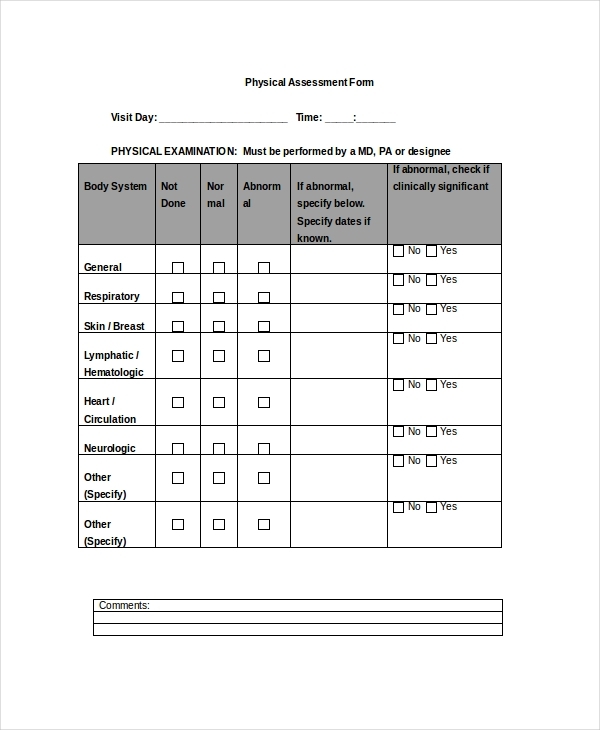 An MD Physical assessment form is a type of a form which is used to determine the heath assessment of an individual. In this particular form, there are various elements which need to be filled with correct information in order to determine the present health condition of an individual. This form is especially used when a person gets into an organization for a job or study. The organization demands to know the various physical characteristic of a person. This is a type of a form which needs to be downloaded from a specific website in order to work out the physical assessment of an individual. This form contains various elements of physical health of an individual. Based on the details of this particular form, a medical practitioner can assess the current physical health of any person. A physical assessment checklist is a type of a checklist which contains information about each and every part of our body. This checklist is used to determine the physical fitness of an individual in the present situation. The various areas in the checklist which are looked upon are the head, neck, eyes, ears, nose, mouth, posterior chest, lungs etc. This list is checked upon a physical practitioner. 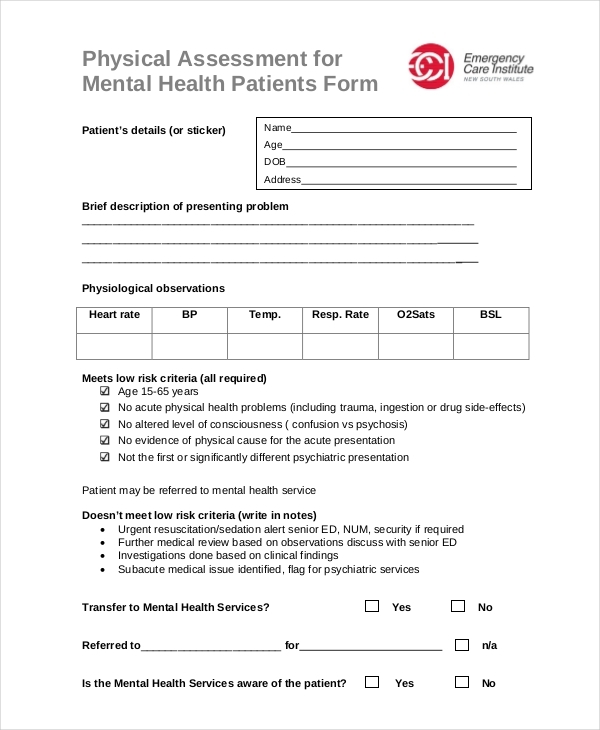 This is a type of a form which contains a brief information about the present mental illness of a person. The form is used to judge a person on his present mental issue. It contains the identity of the person, a description of the mental illness, the various physiological observations and most important the past treatment information. This enables to read a person’s mental problem in a better way. 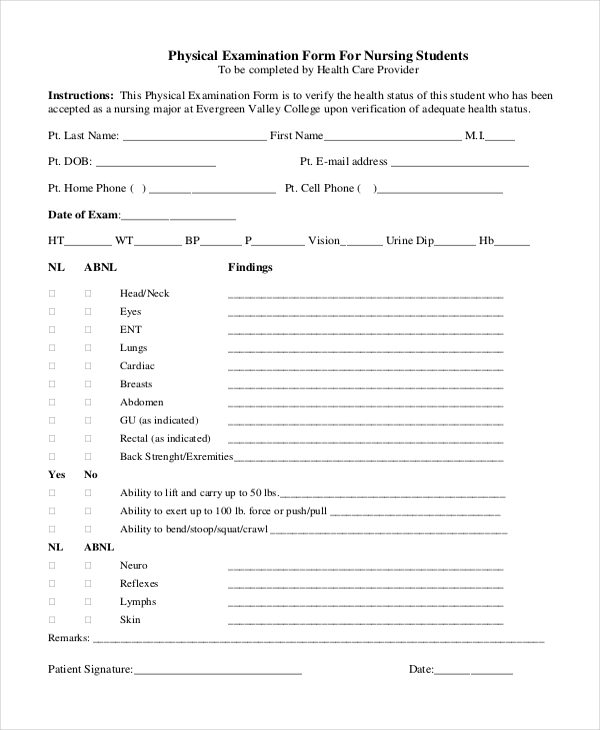 This particular examination form is used to determine the physical condition of a nursing student who is about to get into the work of being a nurse. This particular form testifies the various physical problems, if any, of an individual who will soon start working. Along with the identity of the person, the form has other areas related to physical health which needs to be filled. 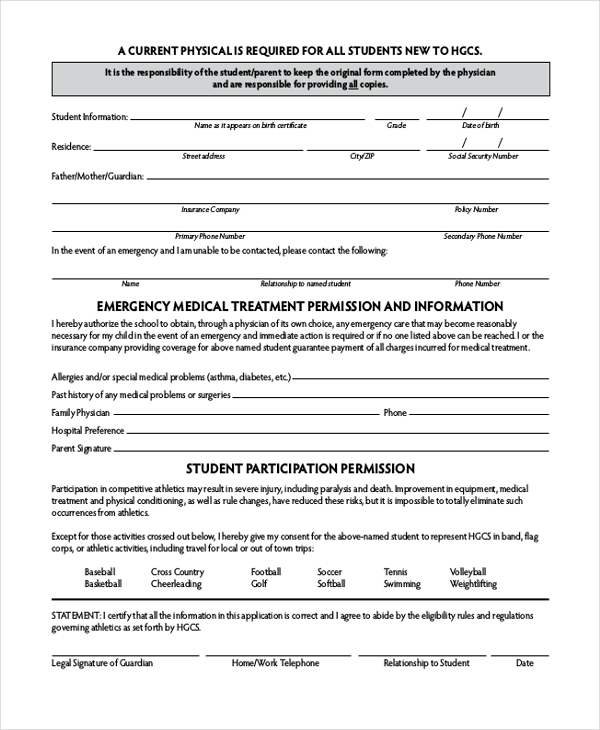 This form is supported by various other medical documents. It is a type of a form which is needed to test the physical fitness of an individual before playing a match. Only after passing the physical fitness examination an individual can play a math of any sports be it cricket, football, hockey, tennis or the rest. 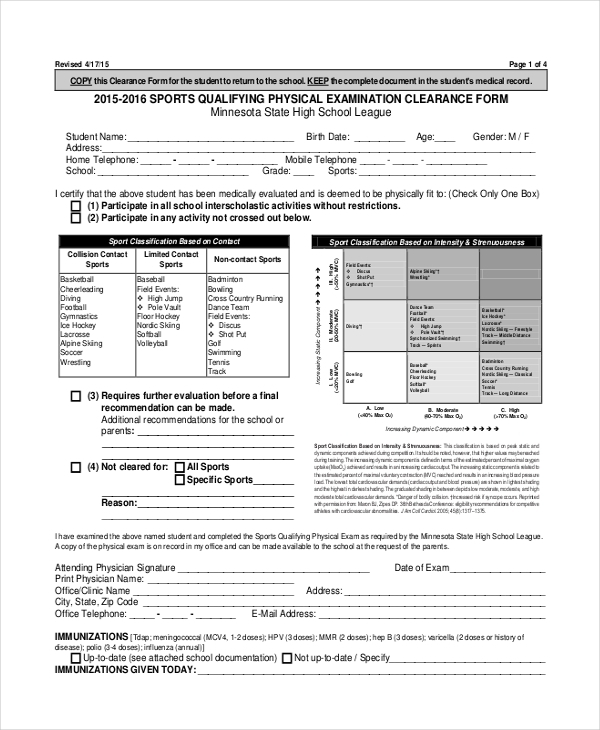 Physical fitness of a player is the most crucial element in playing any sports; therefore this form evaluates the present physical condition of a player. 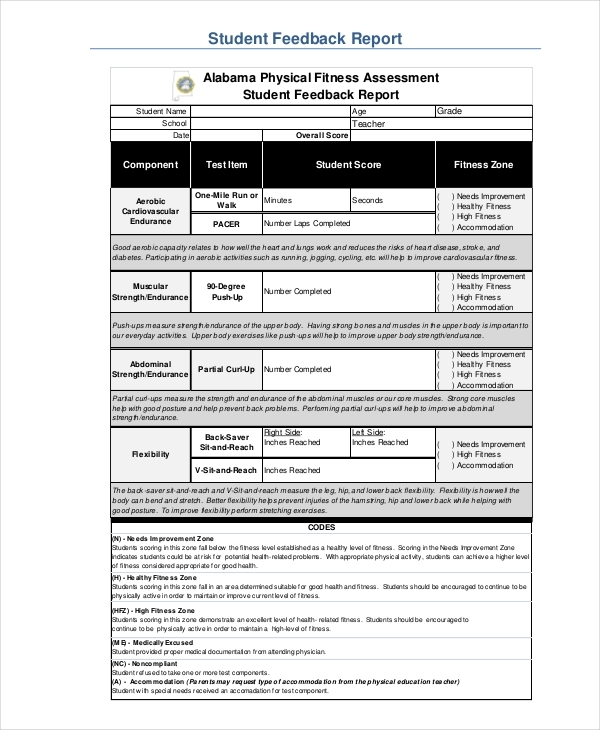 What is a Physical Assessment Form? It acts as a great source to know the current health condition of an individual. The details in the form help in the testing the health factor of any person. The various organization issues this particular form to its new employees for testing their medical health. Filling up the form, helps an individual to know the various ill health attributes in the body. This is important so that a person may go for an immediate check-up. 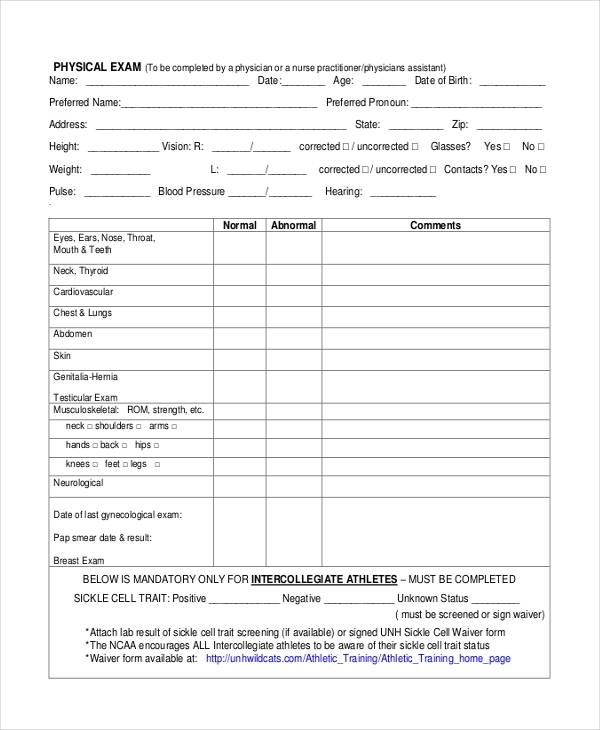 Mostly each and every individual needs to fill up this form at least once for a checkup over his or her health. Therefore, the target group or as we say target audience for this form is wide. There cannot be any such categories based on its target audience. Every individual, avail this particular form for various purposes. A normal employee who works in an office, need this particular form before joining a company, as in the recent times most of the organizations undergoes a physical test of an individual before hiring. A sports person may need it for his physical checkup before playing a match. A sick person also avails this particular form in order to summarize the various problems that he is facing regarding his health. A physical fitness form is of a great use as it completely studies the physical health condition of an individual. The form is used at various places in order to study the physical attribute of a person. This particular form summarizes the various physical characteristics of an individual and helps in determining the present health of that particular individual. Right now, almost all the organizations are demanding this particular form because health check up of the employees has become a mandatory issue. Along with various medical documents, this form helps in analyzing the physical attribute of an individual. A physical fitness form is the only legal medical proof which will determine the physical condition of an individual. The details in this form clearly highlight the various characteristics of different parts of the body. The form is the most important document for a person in relation to his or her health. At every place of work, a person will be assigned a physical fitness form for examination of the present situation. Overall, it can be said that it completely analyzes the physical nature of a person by providing every detail which is needed.